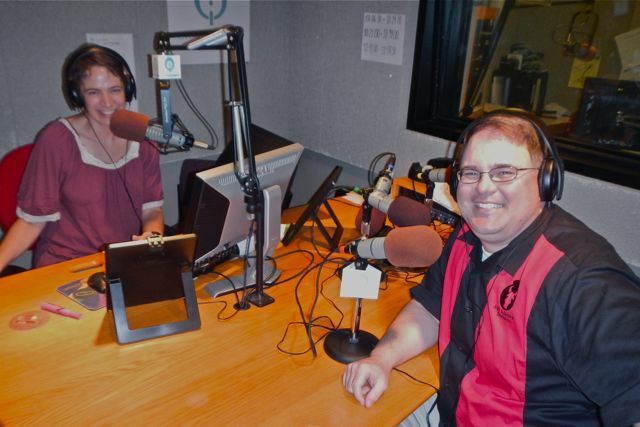 Iowa Public Radio "Talk of Iowa" host Charity Nebbe (left) and Randy Brown (right) in studio during a program May 10, 2013. The writer of "Welcome to FOB Haiku: War Poems from Inside the Wire" appeared on a recent "Talk of Iowa" program on the topic of "Wounds, War and Poetry: Using Creativity to Heal." Randy Brown joined host Charity Nebbe and fellow Iowa veteran, poet, and author Dennis Maulsby on the program, which aired Tues., April 25 and is also available on on-line here. After retiring from the Iowa Army National Guard with 20 years of service and a previous overseas deployment, Randy Brown embedded with his former unit as a civilian journalist in Afghanistan, May-June 2011. In addition to the poetry of "Welcome to FOB Haiku," he authored the 2016 journalism collection "Reporting for Duty: Citizen-Soldier Journalism from the Afghan Surge, 2010-2011." His poetry and non-fiction have appeared widely in literary print and on-line publications. As "Charlie Sherpa," he blogs about military culture at: www.redbullrising.com. Brown had last appeared on the "Talk of Iowa" program May 10, 2013. Dennis Maulsby is a U.S. Army veteran who served during the Vietnam War era as both enlisted soldier and officer. He served for two years as a Russian-language voice-intercept operator. As a military intelligence officer, he served with the U.S. 25th Infantry "Tropic Lightning" Division. He received an honorable discharge in 1970. Maulsby is the author of multiple books, including most recently the poetry collection "Near Death / Near Life" and the short-story collection "Free Fire Zone." Maulsby's "Near Death / Near Life" and Brown's "Welcome to FOB Haiku" each received a 2016 Gold Medal in Poetry from the Military Writers Society of America in 2016.